Sonya Battla revealed her new collection through a photo shoot for a magazine. Sonya Battla fall collection 2012 for women includes casual wear outfits. Some of the outfits in Sonya Battla fall collection 2012 for women are traditional while others are modern. Some of them are embroidered while others have simple but stylish designs. We are sure that conservative and modern women will like Sonya Battla fall collection 2012 for women. This is because the collection includes stylish dresses for different types of women. Overall, we think that the dresses in this collection by Sonya Battla are quite stylish and suitable for wearing for different occasions like going to work or hanging out with friends. Sonya Battla has been working in the Pakistani fashion industry for several years now. She is quite a talented fashion designer and also quite famous. Moreover, she has achieved professional qualification from abroad. She deals in high-end luxury fashion. The designer uses fabrics of highest quality and creates unique dresses out of them. Her dresses attract many women who love and understand fashion. The designer has become even more famous after introducing Sonya Battla lawn. She has her own outlet in DHA, Karachi and is reachable through email. 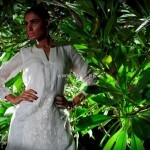 Sonya Battla fall collection 2012 for women can be seen in the photographs below. Photography has been done by Amean J. and the model in Amna Ilyas. Sonya Battla fall collection 2012 is available through the flagship store of the designer. To find the location of this store as well as get other information about Sonya Battla, go to the official Facebook fan page of Sonya Battla. The address of the official page of Sonya Battla has been given below. You will surely get all the information that you need here.